Does he cash in with Iceland kroners or Euros? This is no plaice for a post like that. Sorry to be pedantic but if you read the article it's a halibut. Now, can anyone come up with a more correct pun? 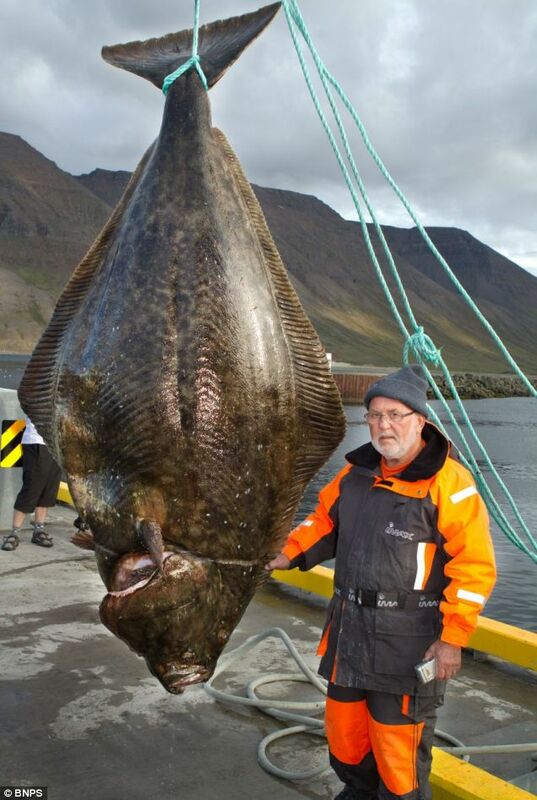 Gunther Hansel, a Veteran angler, has landed the catch of his life – a record-breaking halibut weighing 220kg (34st) – worth £25,000. Whats Diane Abbott doing swimming off the coast of Iceland? Cod Almighty! Look at the size of it! Seriously though, Iceland's problems are off the SCALES! They really are skating along the bottom. These are without a trout some of the worst puns that I have ever read. Do you think they are angling for more bailout money? I keep going to post but you shellfish, bottom feeding lot keep nicking my pearls of wisdom! A trapped woman has finally been freed by rescuers – after being stuck in her bathroom for three weeks. The 69-year-old survived the ordeal by living off tap water, after accidentally breaking the lock on November 1. ‘She was at her wits’ end,’ said a neighbour in the Paris suburb of Epinay-sous-Senart. ‘Her flat is on the second floor and has no window, so she couldn’t call for help. There was absolutely nothing she could do except bang on the wall at night. Saturday. ‘After knocking on the door and hearing nothing, we pressed our ears up against the door and made out a muffled noise,’ said a police spokesman. Firemen forced a window in the bedroom of the apartment and then smashed the bathroom door down. ‘The woman was in a terrible state. She was very thin and weak-looking and was eventually taken to hospital,’ added the spokesman. yep, up to their Gills in it. Iceland's net debt is terrible. Iceland is small fry compared to the problems elsewhere though. Mistaken identification! This is a Halle but she doesn't swim in the Arctic. Krona's, accepting Euro is a criminal offence in Iceland, all conversion to foreign currency in exchange for ISK paper has to done at a government sanctioned rate in Icelandic banks. Nobody outside Iceland will accept ISK a a valid currency. I'm not joining in as my attempts at fishy puns would surely flounder.